Sudden changes to Chinese recycling imports resulted in a wave of concern about our recycling system. Master Recyclers are hearing rumors that materials are getting thrown away or that people should stop putting some materials in their carts. While the Pacific Northwest's reliance on a single market unnecessarily strained the system, so far, it seems to be working the way it should. Companies like Far West Fibers and New Seasons help the region recycle special materials when there are markets for them. 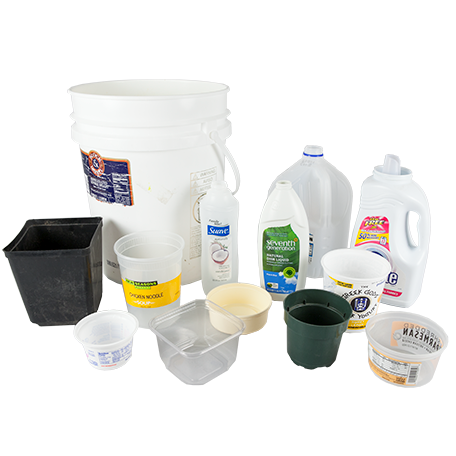 Local jurisdictions refrained from including materials like plastic lids, clam shells and cups in the curbside collection programs, because these materials have fickle markets. Local depots can stop taking materials when these markets dry up. The role of the curbside program is to collect a steady stream of basic materials like paper, metal, glass and some plastics for manufacturers who need them to make new products. To keep the public motivated to separate out these basic materials, it is important that the list is consistent. The sudden changes to recycling markets in China have proven that the conservative list on curbside was the right way to go. Local depots announced that they had to stop collecting materials, and it appears that our curbside collection program will make it through intact. Curbside recycling is not getting thrown away and it is not changing. There are laws in Oregon that require that properly separated recycling be recycled. The State can only allow exceptions to this rule through a formal process. News stories about recycling going in the trash left some people wondering why they should bother to separate materials. The DEQ, Metro, local jurisdictions, and private companies are working together to save materials instead. Mater Recovery Facilities (MRF’s) who sort our mixed recycling, slowed operations down and placed more staff on the sorting line to more carefully separate materials. This slower process allows them to pick out materials for new markets that want specific items and gives them time to remove more unwanted materials. Stakeholders also pulled together throughout the state to identify new local and international markets. Along with saving materials already collected, these efforts aim to ensure we get to keep recycling the same materials. The list of accepted materials that was created in 2008 has not changed and it is not projected to change any time soon. People can keep placing those materials in their curbside program and be assured that they will be recovered. However, all players will need to invest more in our recycling system if we want it to make it through this challenging period. Recycling is still the right thing to do! Making new products from old products fights climate change, pollution, deforestation and mining. Manufacturers are counting on people to separate paper, metal, glass and plastic so that they can make new products from old. In 2016 alone, Oregonian residents, businesses, construction sites and industry separated 2.3 million tons of materials for recovery. Our efforts together prevented the use of 27 trillion BTUs of energy, equivalent to 2.8 percent of the state’s total energy use. We also prevented the emission of 2.9 million metric tons of carbon dioxide equivalents, equal to 4.7 percent of all greenhouse gas emissions statewide. Are you recycling only what is on the list? Our role is to only put in the cart what they can use. Now is a great time to revisit the official list. No wishful recycling please. When in doubt, throw it out (or call metro 503-234-3000). Review these Five Frequent Refuse Fallacies that Confuse Folks.